Item No. 1424 Rusticated Candle Sconce. 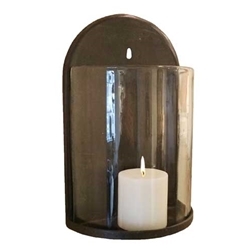 A removable hand blown glass shield gives it a vintage feel. When the candle is lit, it provides a natural and soft ambient light source. Cut-out opening on the backside makes it easy to secure to the wall.